Well, Melba’s left us now…along with all her fine-feathered friends who’d been hanging around the ship during those long days and weeks that our Dynamic Positioning System had held our ship in place over Hole 1256D. As long as we remained relatively stationary, it seems the JR made a pretty attractive place to hang out, clean your feathers, and (when absolutely necessary) get up and hunt for food. 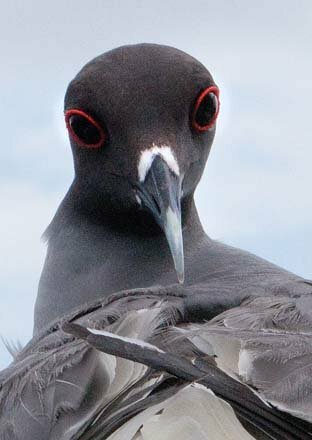 In fact, by the last morning before we began sailing for Panama, I counted no less than 17 swallow-tailed gulls gathered up along the bow of the ship — not to mention two big birds (brown boobies?) who’d practically taken up residence on the windsock pole. Fortunately, a week or so earlier, before all our feathered friends decided to leave us, our imaging specialist, Bill Crawford, took some time to shoot photos of one of the swallow-tailed gulls (I like to think it was Melba) who was hanging out on a metal box just outside the bridge. But as they say, all good things must come to an end, and once the ship started moving, the birds left us…for dry land, better hunting grounds, another ship…who knows? We wish them well on all their journeys…wherever they may be headed.